The way we watch TV has changed. The internet has moved the availability of content beyond linear TV, and the growth of internet based multicast video on demand services like Netflix and LoveFilm, together with the influx of high-quality video that’s now available on YouTube, offer today’s viewers more choice than ever before. But the internet hasn’t only affected our content viewing habits. It’s also irreversibly changed how we discover new shows. How are new TV shows discovered today? Via a newspaper’s TV section? Perhaps. Browsing the EPG? Occasionally, if you’re lucky enough to find a promising needle in the multi-channel haystack. But more likely – especially if you’re a millennial – new shows are found via social media. Or, rather, those shows find you through natural, grassroots advocacy from your friends and workmates. Sometimes those social conversations start around a nugget seeded by the show itself. This could be anything from a great trailer to an announcement of a new casting in a familiar series, or a glimpse behind the scenes of a fresh production. Sometimes excitement bubbles up organically. However it comes about, this brand of social discovery is a powerful force that traditional forms of advertising and promotion struggle to match in 2015. It’s real, trustworthy, and not to be underestimated, which means it should come as no surprise that MarketsandMarkets predicts the social TV market will be worth $256 billion by 2017. Broadcasters are paying attention to these social TV metrics too, as demonstrated by the fan groundswell that brought Community and Ripper Street back via Yahoo and Netflix respectively after NBC and the BBC passed on further series. So, what’s the best way for TV professionals to harness this phenomenon, rather than simply being swept along by its tide? The answer is to be where the audiences are, give them a good reason to come to you, then seal the deal by providing engaging and meaningful experiences around the great content you’ve created. 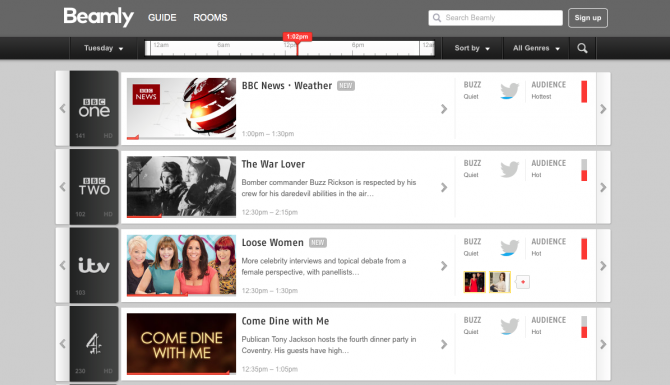 It’s for this reason that social TV start-ups like Beamly have shifted away from their second-screen beginnings to provide a social discovery platform built for TV in all its guises – live, on demand, and beyond. By combining a social networking aspect with great content around TV shows, it’s possible to envelope the buzz of anticipation pre-series, retain interest around a show while it’s live on air, and also maintain momentum in between series.